There’s that guy in your office. You know the one, the guy that always wants to talk politics. You do not like to talk politics. You also don’t like when this guy tries to talk politics with you, because inevitably, it ends up in a loud argument that attracts several of your co-workers that you really want no part of. So you tend to avoid the ‘politics’ guy because you know if you talk to him, an argument that you want no part of is going to be the result. In many ways, thanks to social media, your customers have become that ‘politics’ guy in your office that always starts loud arguments that you want no part of. When businesses began experimenting with social media about 10 years ago, many of us saw this as a breakthrough. Thanks to these ‘social’ tools, companies now had the ability to interact on an individual level with customers, and vice versa. The potential implications to customer service, brand loyalty, customer engagement and marketing in general were massive. Unfortunately, 10 years later, most customers are far more willing to use social media to interact with brands than most brands are to use social media to interact with customers. And when most customers want to interact with brands, they typically want to complain to brands. Check the average brand page on Facebook for example, and the majority of the time you will see the same thing. You will see updates from the brand trying to promote itself and its products and services, then you will see that customers have taken over the comments to complain about issues and problems they are having with those same products and services. For many brands, Facebook has become the place where their customers come to complain about them. The irony of ‘social’ media is that customers will complain about brands on social media, because they know that brands will be more likely to respond quickly, because if they don’t, it looks bad for the brand and the other customers notice. Let me be clear: This is not the customers’ fault, it’s your fault as the brand. 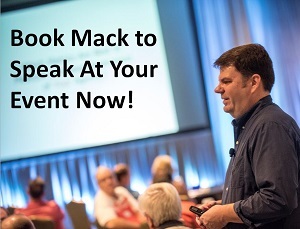 You have ceded control of the conversation with your customers, to your customers. As a result, those customers are going to act in their best interests, which means they are only going to talk to you when they want to talk to you. Which means the only time most of them will talk to you, is when they have to. Like when they have a problem with your product or services. Last week I spoke to a group of rural telecoms and electric providers in Huntsville. I presented Think Like a Rock Star, and part of that talk revolved around how rock stars proactively seek out interactions with their customers whereas most companies only interact with their customers when they have to. I was talking to a friend of mine who leads Customer Care for a global brand that you’ve all heard of about this, and she agreed that most companies only talk to their customers when the customer is complaining about something. The brand itself has little to no desire to initiate interactions with their customers. Since rock stars proactively engage directly with their customers, they have a better understanding of who their customers are, and what they want. Rock stars then leverage this knowledge to improve the experience for their customers. This completely changes the conversation that rock stars have with their customers. Rock stars and their fans understand each other, so the conversation is more open and enjoyable for both parties. On the flip-side, most companies don’t understand their customers, and most customers don’t understand the companies they buy from, so it’s no wonder that the conversation between most brands and customers is completely one-sided and difficult! 1 – Interaction: Rock stars seek out ways to interact directly with their customers, and invite their customers to interact directly with them. These interactions lead to…. 2 – Understanding: By interacting with their customers, rock stars begin to UNDERSTAND who their customers are and why they buy the products that the rock star makes. At the same time, the customers begin to understand who the rock star is, what drives them, why they write the music they do, what their stories are. The rock star becomes more relate-able to their fans and the fans become more relate-able to the rock star. And that understanding leads to…..
3 – Trust: When you understand who your customers are, then you can trust them. When your customers know who you are and why you are doing what you do, then they can trust you. 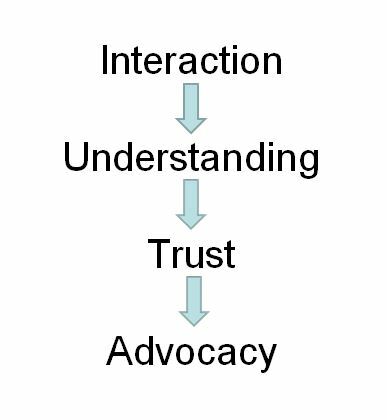 And that trust leads to…..
4 – Advocacy: When you know someone and you TRUST them, you will advocate for them. This happens with customers that know and trust your brand, they tell other people about it. But this process always starts with interactions. Your brand interacting with its customers and your customers interacting with your brand. This is why I am so passionate about helping companies better connect with their customers. I don’t want the only interactions you have with your customers to be when they complain about you on your Facebook page. I want your company to embrace a culture of curiosity about who your customers are. Additionally, I want your brand to take control of how you interact with your customers. You’re going to have to interact with your customers anyway, so why not be proactive and engage with them first, and then apply what you learn to improve your business and marketing processes? The end result is that more you proactively engage with your customers on YOUR terms, the less you will have to engage with your customers on their terms. The less time you will spend fielding complains and problems. 1 – Surveys. Ask your customers who they are, what they like, what they dislike and more. This can be done via your website or email newsletter or even social media. Frame the survey as a way for you to better learn about your customers so you can offer them a better experience. Then make sure you take what you learn from your surveys and apply it to your ongoing communication efforts. What is your definition of the perfect island vacation activity? Also, note the engagement numbers: They are getting a LOT of comments on these tweets. This type of content is also proven to do the best job for brands in driving engagement. Content that is from the brand but not ABOUT the brand, instead it’s about how customers would interact with the brand and its products and services. 2 – Feedback from Customer Service. Every day your customers are calling/emailing/tweeting your customer service department. Make a point to actually note and catalog what your customers are saying when they contact you. There’s a tendency in customer service to handle as many customers as quickly as possible. But in ‘handling’ your customers, don’t simply discard what prompted their contact to begin with. The source of the contact should be noted so you can identify trends and prioritize how you respond. Make sure you are using a CRM (Customer Relationship Management) package that offers this functionality. 3 – Open Rates on Newsletters. If you’re utilizing email newsletter, pay close attention to each issue’s open rate. Specifically, you want to see which topics resonate with your customers. The topics that drive higher open rates indicate topics that are important to your customers, and you can also use this to better understand what’s important to your customers. 4 – Engagement on Social Media Content. Closely watch what types of content your customers are more likely to engage with. I’ll save you the suspense: Content that’s focused on your customers, who they are and how they would use your products and services, will always always ALWAYS get better engagement than content that directly promotes your products and services. Look at the Marriott Resorts example above; They aren’t promoting their resorts directly, they are creating content focused on how its customers would behave if they were at their resorts. This results in content that’s more interesting to the customers, and it provides Marriott Resorts with better insights into how and why their customers come to their resorts. 5 – Always Thank Customers For Complimenting Your Brand. This is so incredibly easy to do yet I see companies every single day that whiff on this. Whenever a customer compliments your brand, thank them. It doesn’t matter if they compliment you via email, phone call, social media, handwritten note, or carrier pigeon. Thank them. When you thank a customer for complimenting you, it signals to that customer that you APPRECIATE them enough to take a few seconds to thank them. That also ENCOURAGES them to CONTINUE to compliment your brand AND it encourages them to PROMOTE your brand. Yes I am going overboard with the ALL CAPS because this is VERY IMPORTANT! Also, you are signalling to all your other customers that if will respond to them and thank them if they compliment you. Additionally, you are helping to shape and change the conversation around your brand, and you’re making it more positive. Which is always a good thing! The reason why you don’t like talking to your customers is because the only time you DO talk to your customers is when you have to. And that’s when they are yelling at you. This is precisely why I work with companies to help them build programs like outreach, loyalty and brand ambassador programs that help companies better connect with their customers. Because I want your company to take control of the conversation you are having with your customers. If you give up control to your customers and only respond to them, your conversation is doomed to be nothing more than your company constantly fielding complaints from your customers. hey’re afraid they’ll lose control of their brand and open themselves up to negative feedback – When you open a business and start marketing your services and exposing your brand to others, people will start talking about your brand. And this is why you exposed them to your brand in the first place. Great point! Every brand has a conversation happening about and around it. From the brand side, the more active role you take in that conversation, whether it be engaging your fans to interact or responding directly, the better. Too many brands completely cede control of the conversation about and around the brand to customers and detractors, which is precisely why too many brands have a negative perception, The smart brands are proactively empowering their happy customers and employees to participate in the brand conversation.